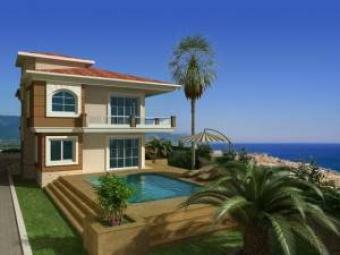 Meanwhile, they are building the: Four Seasons villas on one of the most beautiful places in Alanya district. Here, on a hilltop of the Taurus Mountains in the town Kargicak and five kilometers from the beach are 3 detached villas. Each villa has its own garden with private pool. Anyone who opts for peace, privacy and lovely views of the Mediterranean Ocean feel at home here. The nearest village: Mahmutlar is easily accessible to the many shops and restaurants. Each villa has 2 floors and comprises: spacious living room, kitchen, 4 bedrooms, 3 bathrooms, 1 with a Jacuzzi and a private sauna.